The site is at the corner of St. Thomas Street and Mitchell Lane. The major Redcliff Quarter regeneration scheme stands on the opposite side of St. Thomas Street. The developer has planning permission to demolish the existing 1960s, 5-storey office building, which ignores the material palette of the Redcliffe Conservation Area. The replacement building would be accommodation for 387 students and would not create a locally unacceptable concentration of students. The new building would be 9-floors tall, stepping down to 7-floors in Mitchell Lane towards Victoria Street. 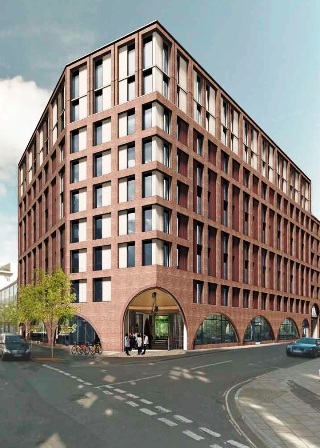 Behind the glazed walls, infilling the arches at street level, will be commercial space and student support facilities that create visual permeability and active street frontages. An archway entrance turns the corner of St. Thomas Street and Mitchell Lane to give access to an open-air courtyard. The materials of the façades will be red brick with metal window frame and sills. Floors 8 & 9 are a loggia of recessed columns infilled by Portland stone. The material palette reflects the dominant brick character of the conservation area. There will be 3 new trees planted in pits in St. Thomas Street. The scheme has gone through three major revisions. The Society objected to the height, mass and design of the first two designs. The final revision reduced the building from 11-floors to 9-floors stepping down to 7-floors, with fewer bed spaces. The Society supported the final designs and materials but was unsuccessful in its request for a further height reduction to respond better to the buildings in Mitchell Lane, particularly. It looks so much better than the rubbish that is there at the moment.